When I was a contest groomer, I always did my Poodle cuffs by hand. I would brush the coat down then give it a quick fluff with my comb. Once it was fluffed, I’d glide a long straight shear in and set the lower edge. Then I’d re-fluff and grab my long curved shears to round and bevel the edges. It was time-consuming. Done well, the beveled cuffs came out gorgeous. Done poorly, they were a sloppy mess. I had four chances to be perfect with my cuffs – or four chances to really mess up. On most of my pet trims, I cheated off excess leg hair by skimming it with a guard comb. Not only was it fast – it helped me set the length, too. Once I had the legs roughed in, I would brush the leg coat over the clipped foot with a firm slicker brush. 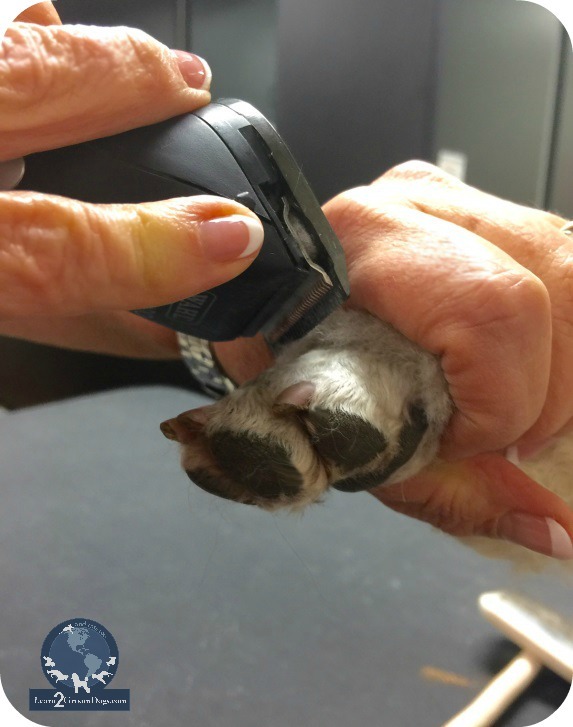 I would slide my hand down the leg with my thumb and first finger resting just below the clipper line on the Poodle foot. My fingers would be my guide as I slid in a small pair of detailing scissors (I choose small shears for the safety of my own fingers!). I would scissor all the way around the cuff line, removing the longer hair. When I released the coat… voila! A perfect cuff for an active pet. I could adjust the fullness of the beveled cuff by adjusting my scissored line somewhere between the lines of the knuckles of the foot and just below the clipped line on the foot. The lower I was on the foot with my cuff line, the fuller the bevel. I used this method for years. I even started to incorporate it into my more polished work in the contest ring. It worked well there, too – especially if I used it as a double-check after I did my cuffs with longer shears. In the past few years, I’ve seen extremely talented stylists start using another method to get perfect cuffs every time. They use a #30 or #40 blade on their clippers! Who knew? It’s very similar to my old method, but instead of shears, pet stylists reach for their cordless 5 in 1 style clipper. They set the blade at the shorter levels, basically the length of a #30 or #40 blade. Hold the foot off the table at a comfortable level for the pet. With a firm slicker brush, brush all the hair down around the foot. Once the coat is brushed into place, slide your hand down the pet’s leg, thumb and forefinger closest to the foot. When you release the coat, the fur will be nicely beveled. The line should be crisp and free of all stray hairs. As with the hand-scissored cuff, check the work from all angles to make sure the cuffs are level from side to side and front to back. Don’t forget to look from table level when inspecting your cuffs for perfection.